Discussion in 'Apple iPad News' started by JohnnyApple, Apr 8, 2010. Chitika is a large advertising platform on the internet, so they see a wide arrange of browser combinations and eyeballs. 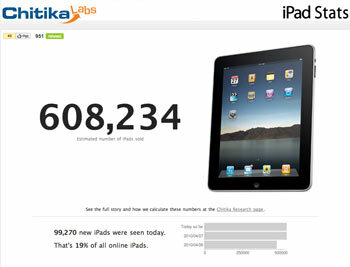 They take a look at the number of unique iPads that get served a chitika ad, then extrapolate that based on the number of regular devices that see an ad and estimate a number of iPads sold. Suffice it to say, it's not 100% accurate but it is a good guess. Thanks to Sonny Burnett for posting about it and letting us know! I'm really amazed by these figures. With the launch of the 3G iPad coming and the rumored International launch, Apple has a good chance of hitting 1 million units sold within the first 30days of sales. These numbers are way off from Jobs official sales numbers statement today. How do you account for that? I'm sure many are wondering the same thing. Perhaps many iPad owners have reset their iPad for one reason or another so the next time their iPad visited one of these sites that counts each "unique" iPad it was counted a second/third/fourth time depending on how many times the iPad was reset. The Wireless card in the iPad has a unique MAC Address (Serial Number) the first 3 hex digits tell you who the manufacturer is. The next 3 are trivial. I am sure that that is what the people who are counting the iPads used. I know for a fact that you can change the MAC Address that is broadcast on a windows machine, but I don't know if it is possible in iPhone OS without a lot of trouble. I think that we have all been duped by the advertising firm (including me!). I think you're on to something. I don't know how a website can get MAC addresses however, because MAC address are Layer 2 and that information is not delivered further than one Layer 3 hop. They can get your IP address of course which is Layer 3. But we all know IP addresses on mobile devices change all the time. Of course it could also be as simple as someone in the ad firm screwed something up by accident. Ah. Here is Chitika's explanation. See below or read for yourself. Well, it appears that our assumptions in calculating iPad sales have been way off. That’s the bad news. The good news is that Steve Jobs has given us (and the rest of the world) a second data point – about 450,000 iPads sold through end-of-day yesterday. With this, we’re able to get the proper assumptions – mostly, we need to refine our assumptions on how many unique IP addresses the average iPad hits our network from. We should have the tracker updated with the second data point and correct calculations soon. Obviously, our 700k number is fairly far off. Thanks for the patience. So it looks like an iPad coming through our system will hit from an average of 2.73 different unique IP addresses. As a fix, we’ll be implementing this as a modifier to the growth numbers. Should have an accurate count up soon. We’ve updated the tracker to reflect a better statistical understanding of the IP-address-per-iPad quandary. Basically they were counting unique IP addresses from iPad devices and made assumptions on how many unique IP addresses an iPad will use in a given day. This is an impossible assumption to make. That's a good point, especially with a portable device, the IP could change countless times per day depending on the owner and where he/she is using their iPad.